Please provide the URL link to your blog, browse through the Community Categories list and tell us which ONE category you feel best fits the focus of your blog. If you fail to list a preference, we will place you in the category that we feel best matches the content of your blog. Important Note!!! Please make sure to copyright protect your blog content before you ask us to post your link in our Blog Categories. We now have My Free Copyright protection on all our original content, with the button posted clearly at the top of our page. My Free Copyright is a very simple, quick 3-step process that will give you a free electronic "thumb print ID" stamp on each of your blog posts. As of today's date, 1/24/10, we will ask that all bloggers implement some form of copyright protection for their blogs before we will post your link to our Blog Categories. This is for your protection as well as ours. MANDATORY: In order to list your blog on this site in our Categories Lists, we require that you grab our button below and put it on your site. 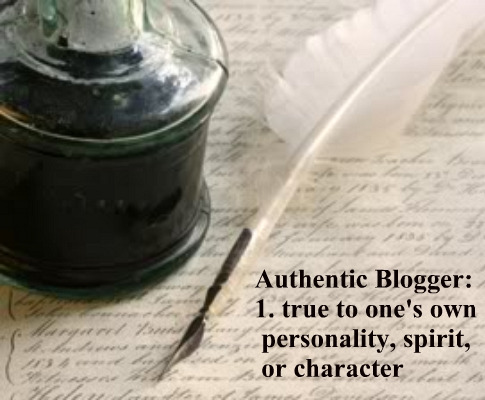 We will check you URL link to make sure that the Authentic Blogger button has been posted to your blog, then we will list your link in the requested Category. Thank you!